I adore wearable art. I have many pieces in my vintage collection, most of which were discovered at estate sales over the years. This white silk Chinese embroidered garment with silver threads attracted my attention this week. I never know where my gaze will land! Though the temperature was in the 90’s, this piece was the perfect choice. Silk is breathable and has impressive moisture wicking properties, keeping me comfortable despite the weather. Daniel and I traveled the short distance to the Denver Botanic Gardens HERE in search of a kimono worthy background. The gardens did not disappoint. Strolling through the gardens makes me feel peaceful and mindful. An oasis in the middle of the city, it reminds me that there are healing spaces and sanctuaries from the pain, suffering and conflicts widely apparent in the world. When I feel powerless and deeply imperfect, this is the ideal place to be. Kimono and jewelry estate sales, small black satin headpiece adorned with black jet beads – gifted, black heeled sandals – consignment shop. 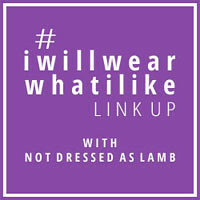 Linking up with Catherine’s #iwillwearwhatilike HERE at Not Dressed As Lamb and Patti’s Visible Monday HERE at Not Dead Yet Style. be interviewed for a book on “Women, Dress, and Aging: Stereotypes and Reality” which I am developing with a co-author? If you are interested, let me know an appropriate time and contact phone number or e-mail. What lovely photos and sentiments. Thank you. Love the outfit especially the hat! Stunning, and of course, you had the perfect hat to wear with it. Seeing and reading your blog also brings a breath of freshness and peace. content sigh inserted here. I would agree with Ms. Farrell-Beck that the robe is more likely to be of Chinese origin than Japanese, mainly because of the neck and sleeve shape. No matter, it is beautiful whatever its ethnic background! Those must be the gardens that we tried to visit when I was there, but they were closed for a private function. What a gorgeous background for your outfit. I hope you are keeping a portfolio of these lovely photos Daniel is taking of you. If nothing else, they are an excellent catalogue of your favourite outfits. Beautiful, beautiful. You look cool as a cucumber. An interesting (maybe) side note. I believe that while white is associated with metal and purity in Asian countries, it is also the color of mourning. A bride, for instance, would wear red, not white, as red symbolizes joy and good luck. Regardless, you pull the look together and pull it off. Absolutely gorgeous. You are so clever at finding these treasures. Your outfits always seem to come together effortlessly and look so polished. I love how it is so very true that we never know where our heart or gaze will land on any given day. I am inspired to dig my vintage kimono out of the wardrobe… mine is black with the HUGe sleeves that are made for swishing BUT your cream Beauty has me pea-green with envy. The botanical gardens were the perfect setting to showcase this beautiful oriental piece , that you have styled perfectly with your black pants, heels and of course the perfect hat. I totally agree that a visit to a garden is a peaceful escape in our troubled world. I adore kimonos so I love this one as well. You have styled it to perfection. What a lovely piece and how well your hat (what a find), trousers and accessories compliment the jacket. What always surprises me, are your shoes. I know you also buy vintage shoes or you have shoes for a long time and they NEVER, EVER look outdated. As a matter of fact, they always look desirable. I love these sandals. I felt in love with this kimono robe dress worn with dark blue denim pants and lovely heeled sandals.